The Post and other tabloids in New York just love making fun of DOT commissioner Janette Sadik-Khan, echoing Marty Markowitz’s claim that she is a zealot, and accusing her of imposing an anti-car ideology on New York, in order to turn New Amsterdam into Old Amsterdam. Making things somewhat easy for the schoolyard humor of the tabloids is the matter of Sadik-Khan’s unusual last name, perfect fodder for the Post Pun-Bot 3000 headline generator (Khan job, Wrath of Khan), protest signs (“Don’t be Conned by Sadik-Khan”) and blog comments. Working in a world of puns is the bread and butter of the tabloid world. Oftentimes they’re actually funny, like yesterday’s Sue and a Half Men. But looking beyond the jokes the papers use to describe Sadik-Khan’s name, one can easily find an somewhat uncomfortable, almost reflexive use of sexism to describe her personally. Mike Bloomberg is typically described as a bully, an elitist, or New York’s own version of Napoleon, imposing his will on his subjects. But Sadik-Khan? She’s just that nutso bicycle lady. Yes, her predecessor at the DOT was also a woman, but I don’t recall such a level of gender-based invective thrown at Iris Weinshall. And besides, it’s much easier for chauvinists to keep their sexism in check when a strong woman pushes an agenda that conforms with their worldview. Had Weinshall realized that her job involved more than just keeping the traffic moving, and installed a pedestrian plaza in Times Square or a separated bike lane, perhaps she too would have been vilified by the tabloids in the same manner as Sadik-Khan. To make matters more complicated, as these things often are, many of the insults leveled at Sadik-Khan come directly from women themselves, perhaps giving cover to some of the uglier sexism at play. 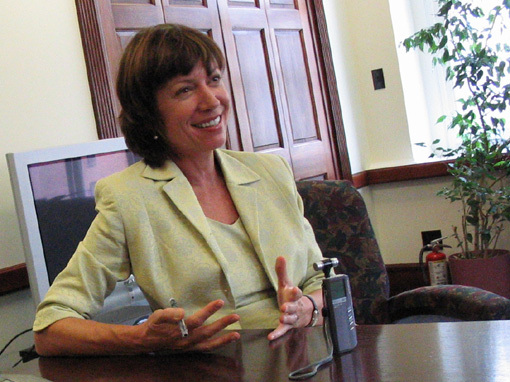 Is Janette Sadik-Khan, the psycho bike lady who helms the city’s Department of Transportation, nuts? Here’s Peyser again (1/11/2011) comparing NYC department heads to Snow White’s seven dwarves. The six other “dwarves” of the Bloomberg administration are merely given nicknames such as Sleepy and Dopey, but Sadik-Khan merits an additional descriptive. Sanitation Commissioner John Doherty (Happy) was first to swallow the administration Kool-Aid. He said that as a blizzard with hurricane-force winds barreled down on the five boroughs, including several that are not Manhattan, he and Janette Sadik-Khan (Grumpy) — psycho bicycle lady who runs the Transportation Department — made a decision, on their own, not to declare a snow emergency. As with any kind of prejudice, irrational thinking often contradicts itself in the span of the same thought. Here’s a New York Post editorial, 2/27/2011, that manages to use both diminutive and domineering terminology to describe the DOT chief. New York’s bicycle belle has her eye on 34th Street this time, which she’s planning to transform into another teeming walrus wharf . . . er, pedestrian plaza. Which is why it is critical that the City Council exert its every power to force Madame Bike-Lady to explain — publicly and in detail — what she has in mind, and precisely what its impact will be. Even when the subject isn’t bikes or pedestrian plazas, Sadik-Khan’s alleged bicycle obsession is the lens through which she supposedly sees everything. Here’s the Post editorial page again, in a story about the blizzard response, 1/18/2011. Notice how she’s portrayed as a helpless woman, protected by her male coterie, who is simultaneously powerful enough to dump on the NYPD commissioner. Team Bloomberg — Deputy Mayor for Operations Stephen Goldsmith and Sanitation Commissioner John Doherty — ran interference for Sadik-Khan during last week’s City Council hearings, assuming virtually all of the blame themselves. Yet that’s not enough for the Bicycle Lady: She has to throw slush on Kelly. But the growing debate over all those empty bike lanes imposed by our mayor and his transportation commissioner, Roberta Moses, is just a symptom of something more malign: the suffocation of the very spirit of our city. When Ms. Moses (aka Janette Sadik-Khan) declared diagonal Broadway irrational, started shutting down stretches of it to automobiles and all but said she’d like to see it gone because it violates the city’s grid, not to mention the earth, I saw red, not green. Then there are the more subtle digs. Back at the Post, here are Sally Goldenberg, Larry Celona, and Bob Fredericks on 1/18/11 in story about the blizzard. Yes, it could just be a clever use of winter weather words, but it’s hard not to hear ice queen echoes in this and other language used to describe Sadik-Khan. There’s no one j’accuse instance of sexism in any of these or the many more articles you could probably find in five minutes on Google, but there’s a pattern. Great post. It is indeed blerg to see all of that stuff together. I think the sexism is certainly abetted by the fact that Sadik-Khan is not just competent, but extremely pretty. If Weinshall had made the same improvements, I sincerely doubt she would have been treated the same way. Sure, she was protected by both her husband’s power and her own middling vision, but I think she would have also been spared because she is not an attractive woman. As a woman, I don’t really enjoy saying that very much, but I believe it’s true. The improvements J S-K is implementing make the city safer, calmer, greener and less “tough” and there are many people invested in NYC remaining a tough town, who gain enormous satisfaction from associating themselves with its toughness. It’s not just Sadik-Khan but the improvements themselves that get dismissed as feminine. The fact that J S-K is the face of these reforms leaves her particularly open to attacks that reek of sexism, faux-populism, and weird nativism. CHUCK SCHUMER’S EVEN lesser half physically may resemble the androgynous “Pat” character from Saturday Night Live, but she has the political instincts of Rudy. In classic Giuliani fashion, the senator’s wife tried to install a seven-foot-tall chain-link fence along the Queensboro Bridge without approval from the city’s Landmarks Preservation Commission. She often (incorrectly) says that her job is “to keep the traffic moving,” which even includes through city parks: Weinshall opposed making Prospect Park car-free, possibly out of unfounded concern that overflow traffic from the park would be displaced to Prospect Park West, which happens to be where she and Chuck live. In the aftermath of the Staten Island Ferry crash, she screamed for investigations on-camera, but took little action when the microphones disappearedher attention, apparently, turned back to protecting union boss Mickey McFarland, accused almost two years ago of bilking the DOT by falsifying the records of waste-disposal runs. Please fire Janette and send her home. We could use her here. I think if JSK were ugly the Post would be even more vicious. It’s okay for a man to be fat or ugly and powerful, but it’s definitely not okay for women. BSF, thanks for that find. I dug around and couldn’t find anything, at least not from the Post or Daily News.